join our crew. help us save lives. 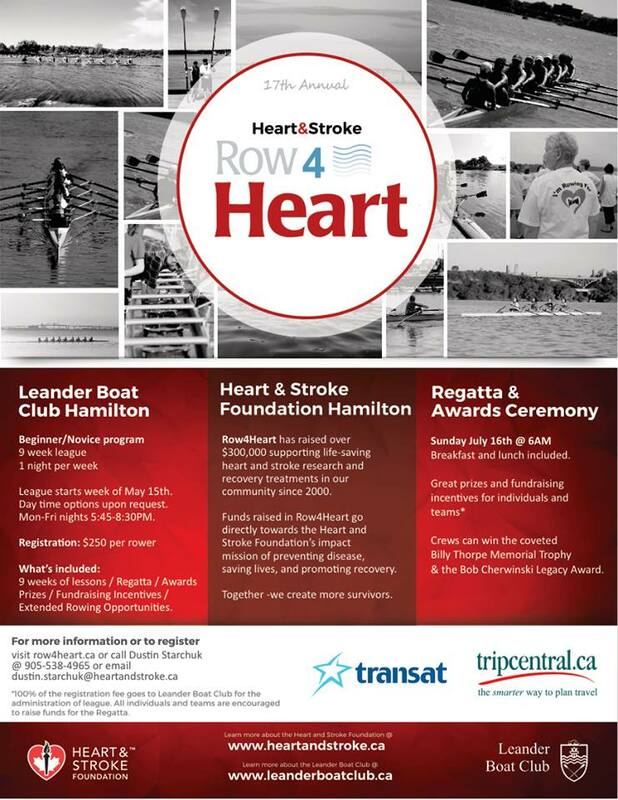 Since 2001, Leander Boat Club and the Heart and Stroke Foundation have shared in “Row4Heart“. Our club takes great pride in our association with HSF! This program brings people from Hamilton and the surrounding area to our clubhouse on the harbour where they learn how to row and prepare for the Row4Heart Regatta held in mid July. Fun and teamwork are important elements of this program. While the competitors train hard for eight weeks to compete in our regatta, the main thrust of the program is fundraising for research supported by the Heart and Stroke Foundation of Ontario. The goal in this event is to be as fast a crew as possible while gathering pledges for the HSF. Results in the regatta are based on speed of the crew, as well as how much money the crew manages to raise. To date the competitors in this program have raised over $300,000.00 for heart research! Crews can be corporate, neighbourhood groups, families, rowing parents or community crews where small groups join with others and meet new people while learning to row. Our coaching staff consists of a wide range of our club athletes from our oldest athlete, who is 85, to some of our newest athlete/coaches end even some coaches who have been on our National Team! All of them bring their passion for the sport and a willingness to share their experience with new rowers. For registration information please contact Andrea Jansen (Program Coordinator) at lbcrowing@gmail.com.